But you know what is even harder? 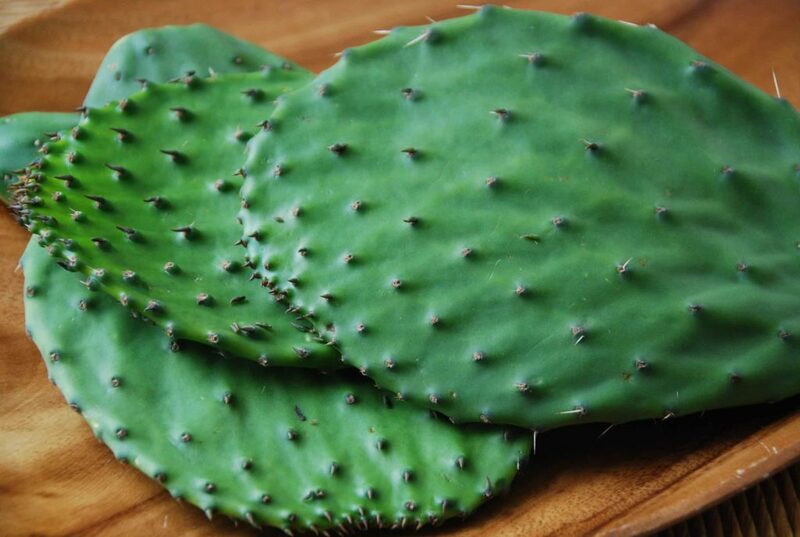 To think of a Mexican table without cactus, or nopales, on our plates. They’ve been a crucial ingredient since pre-Hispanic times. Though there are hundreds of varieties, the most common is the Prickly Pear cactus. It has fleshy leaves or paddles, that are used as a vegetable in salads, stews, soups, eggs, stews, all sorts of appetizers and even smoothies and juices -a really popular one combines nopales with orange juice and my mom is fond of adding fresh spinach to the mix. They are used as a base to mount other ingredients onto, as a wrapper instead of thick tortillas and as a filler or topper for tamales, quesadillas, tostadas… They are found from breakfast to dinner options and anywhere in between (continue for more information and photos). They grow onwards and upwards in a funny way, from paddle to paddle. Their skin is shinny and green, and it is covered in tiny, almost transparent, thorns that happen to be quite vicious when you try to remove them from the little bumps they grow out of. If the paddles aren’t cut, those bumps grow into tunas, or prickly pear fruits. Nopales are so filling and versatile, that I am waiting to see them star as a top choice for vegetarians outside of Mexico. More so, as they are insanely nutritious, with vitamin A, C and a loadful of Iron. And to top that off, they are low, low, low fat. They can be cooked in many ways, from boiled, to steamed, sautéed, grilled and are delightful when pickled. Whichever way they are cooked, they have an irresistible chewy meaty bite and a mild flavor that has a tart edge to it. One reason they haven’t spread like wild fire may be that many people don’t know how to cook them and when they try, they don’t know how to deal with the gelatinous, viscous, slimy liquid they exude as they cook. Now, you can’t let yourself get discouraged from that description, there are many ways to deal with that gooey liquid -think of cooking down mushrooms-. I have my favorite way, that always works! 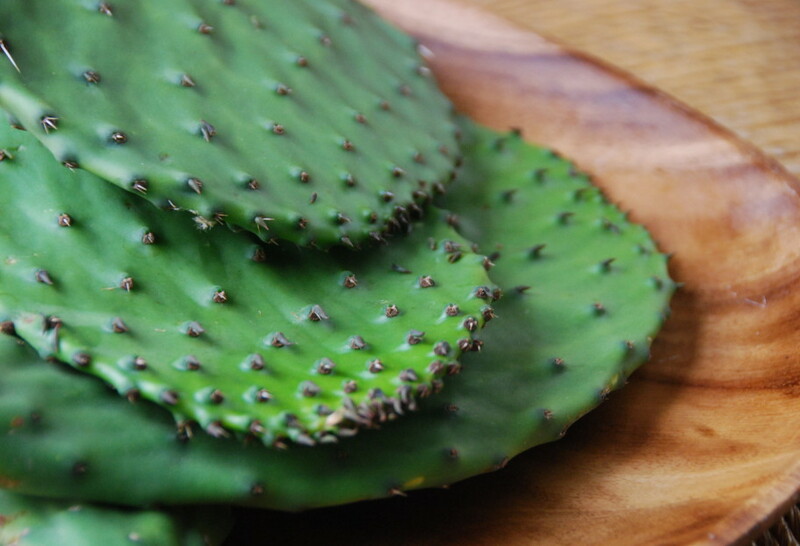 Another reason nopales haven’t become so popular outside of Mexico, yet, may be that they are not… so… easy… to clean. Skilled Mexican cooks get away with removing the thorns without being pricked and out in the country they tend to be cleaned with a machete. It does take some practice, but there are ways to go about it even without such a rough tool. Hello there. I used latex gloves when cleaning/peeling nopales. They protect my hands and save me lot of the pain since spikes hardly penetrate the latex. I came across your show a few months ago and been watching it since. Cannot wait for the new episodes to be air, all around the Bajas from TJ (Where I lived many years before moving to NY), Ensenada ( my mouth get watery thinking of all the fish/marlin tacos I ate there) and Los Cabos. Oh I hope the new season brings back wonderful memories for you, Luz! I’m so excited to share it with you. I watched a show that aired recently on my local PBS station. I don’t remember what the dish was called, but it had diced Nopales, Corn and some other ingredients. It was the episode where you also made Egg Enchiladas with a Black Bean sauce for your family. Where can I find the recipe for the Nopales & Corn dish? If you are ever in St. Louis, MO during the Summer (when local tomatoes are ripe) I would love to have you try my fresh salsa. It is a simple salsa, but not cooked. It has a very fine chunk texture. I make a mild version that anyone can eat, and I make a Spicy version that is too hot for most people. I prefer a mixture of the two, since the Hot version is more heat than I like. My wife and I both enjoy your show. Your dishes are wonderful and creative. Your show is fun to watch. We also learn all sorts of interesting things about Food, Mexico and cooking. Thank you for all you do. It is obvious you put a lot into your show and cooking. And your tomatoes and salsa sounds delicious! I make them 2 ways. The first,I simmer the cut cleaned paddles in beef bullion, rinse and add to a pan of sauteed thin beef slices, delivered onions and chopped garlic. Then I add enough beef bullion to cover all along with some Mexican oregano that I have rubbed between my palms and 1 or 2 Serrano peppers. Cover and simmer about 30 minutes or so, stirring a little, thicken with some cornstarch and water to a gravy consistency, and serve over plain white rice. We love it. The other way, after boiling,I add them to chunked tomatoes and sliced onions and chopped garlic with about a teaspoon of Italian seasoning (or you can use fresh oregano, basil and marjoram if you have it) and saute in a little olive oil until all are tender. Makes a great vegetable side dish. 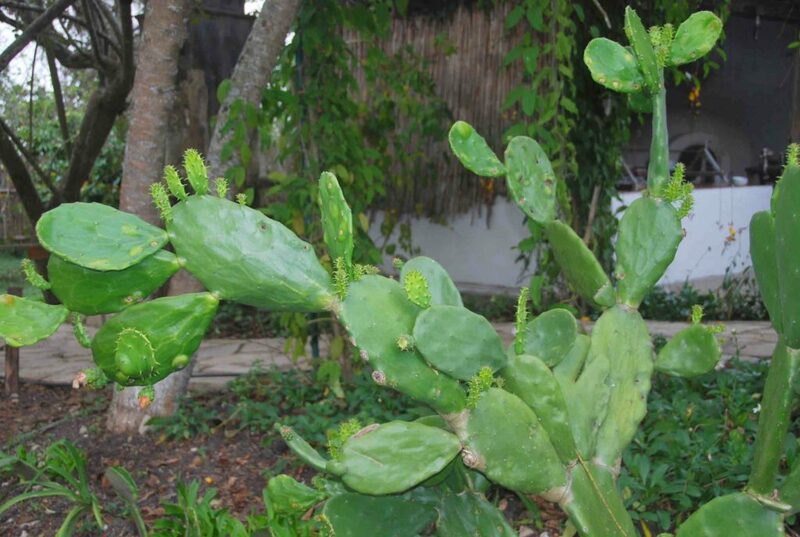 Would like to know more about eating the fruit of the nopal? Thank you for sharing, Jeanne! No tienes recetas para las “tunas” ? Tengo nopales creciendo aquí en mi casa y me encantaría poder usarlas también. Cómetelas así nada más peladas o en agua fresca! I love your show and mexican food. I am always looking for new healty foods that is loaded with vitamins to try, I found napoles very tasty I cook them simular to okra and serve them with black-eye peas and in omeletes. I prefer vegetables. Occasionally I will eat seafood once or twice a week, we don’t get fresh fish here mostly frozen. Nopales are such a fabulous vegetable, we eat them at home all the time. When the waitress came with the dish and we saw they were “nopales”, we were so disappointed and argued he was serving the wrong table. After clarifying the misunderstanding, we laughed so much and that made our celebration unforgettable. I’m glad you like “nopales”, they are so good and healthy!